Cooler weather makes me long for soup. Nothing warms or comforts better than a hot bowl of creamy, thick soup, full of rich and satisfying ingredients like chunks of beef, tender carrot, crisp onion, and melted cheese. And soups are so easy to make! 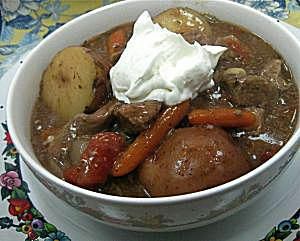 Just combine the ingredients in the crockpot or in a saucepan on top of your stove and let it cook away. Soup can be a meal in itself; ​add some homemade cheese crackers or some crusty, chewy bakery bread for a finishing touch. Try croutons, crisp crumbled bacon, goldfish or oyster crackers, or toasted nuts too. Enjoy these soup recipes and savor the flavors of fall and winter. Frozen vegetables are the shortcut in this delicious recipe. Add them during the last 30 minutes of cooking so they stay crisp but tender. The type of beef you use is up to you. Everything from sirloin tip to beef chuck is a good choice. Oddly enough, beef sold cubed as stew meat, may not be of very good quality and you should use other cuts. Fall's quintessential ingredient makes a velvety, rich soup. Top this one with some purchased pesto for a fabulous dinner that's fancy enough for company. Frozen fully cooked meatballs are the secret ingredient in this yummy slow cooker soup. ​Once you try it, start experimenting with additions and spices that you prefer. You can change it to add the flavors of many different cuisines.​ When you hit upon a combination that you like, be sure to write it down so you can reproduce it. This simple chili develops wonderful deep flavors and texture when cooked in the crockpot. You'll come home to a hearty meal and you can top your chili with cheese, sour cream, cilantro, tortilla chips, or even some pico de gallo. What Are the Best Italian Bread Soups?